In Prince William Sound, we viewed Cox Glacier from the catamaran. Being in the Sound was like being in an icy cathedral. The overhanging clouds made a high ceiling. 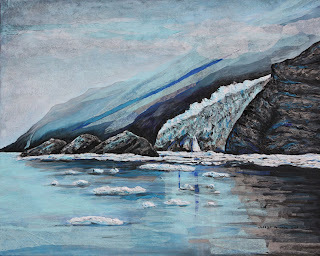 The mountains with the hanging and tidewater glaciers made black and blue walls. The atmosphere was gray, thick and calm. Within the sound was the calving of the ice; everyone stood still with a certain reverence for nature. Being there was like being a part of the earth's life processes. 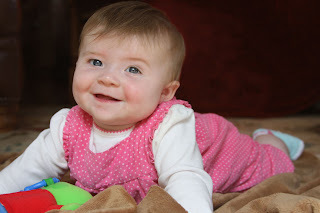 This is my granddaughter, Audra. She is almost 6 months old. Her mom, Amy, has entered her in a Gap/Disney contest. Please follow the link to vote for Audra . You can vote for her every day until Nov. 17th if you like ;) Thanks! 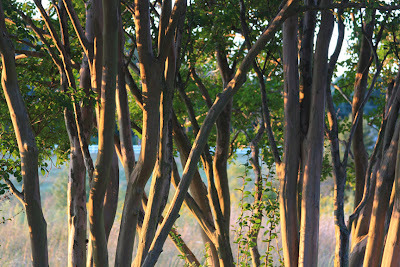 This photo was made as the sun was setting through the crepe myrtles in my parents yard in South Carolina. The name is was given to this plant because of the papery crepe-like flowers that bloom though the summer. The bark will peal off in sections making the trunks interesting.